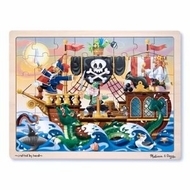 Sailing over the bounding main comes the ship in this Pirate Adventure Jigsaw Puzzle, where even the mouse is ready for adventure! Discovering all the fun details in this picture will be an adventure for the assembler! This wooden, 48-piece jigsaw puzzle comes packaged in a sturdy, wooden tray for puzzle building and easy storage.